This Sunday I spent a delightful morning in the company of seven other birders, all members of the Queens County Bird Club, on a field trip exploring the ponds and parks along the south shore of Nassau County (the county immediately to the east of Queens). Of course, Nassau County is heavily developed, with housing, highways, and the bane of human existence, strip malls, everywhere, but there are a surprising number of parks with rather sizable ponds that support a variety of waterfowl and other bird life. The main goal of the day was ducks, but the group of birders that met up at Lofts Pond Park in the town of Baldwin at 8 AM seemed willing to take a gander at any species, so long as it had feathers. I had been fortunate enough to connect with a wonderful gentleman named Lou who picked me up and drove me to the meeting place (and from pond to pond and home at the end of the day) and when we arrived at the appointed meeting place we quickly started scanning the pond with the other birders to see what was there. The early-arrivers got us on the two Great Blue Herons, the Great Egret, and a single drake Hooded Merganser that we soon realized was one of four hoodies present at the pond. Also present were the Mallards, Canada Geese, and American Black Ducks that seem present whenever there are any waterfowl to be found. A bit more searching turned up a pair of Green-winged Teal, and then an Osprey surprised everyone with a quick flight over the pond (Osprey get pretty rare by November). The highlight at Lofts Pond Park, though, was the pair of Belted Kingfishers in the photo above. The chasing bird is a female and the chased bird is a male, and they put on quite the aerial display before they disappeared from view. None of the birders present could ever remember seeing such a dogfight between kingfishers as the two birds put on for us. Our next stop in our west-to-east trip was Milburn Pond Park, which had a slightly more diverse array of ducks, with a Pied-billed Grebe, a Ruddy Duck, and an American Wigeon joining the aforementioned waterfowl. A Greater Yellowlegs with bill tucked in and looking out of place was a pretty cool find, as were two Hermit Thrushes feeding on berries. We also added more passerines in the southern portion of the park, with several common species of sparrow showing and a Red-bellied Woodpecker and a couple of Northern Flickers giving themselves away through their calls. 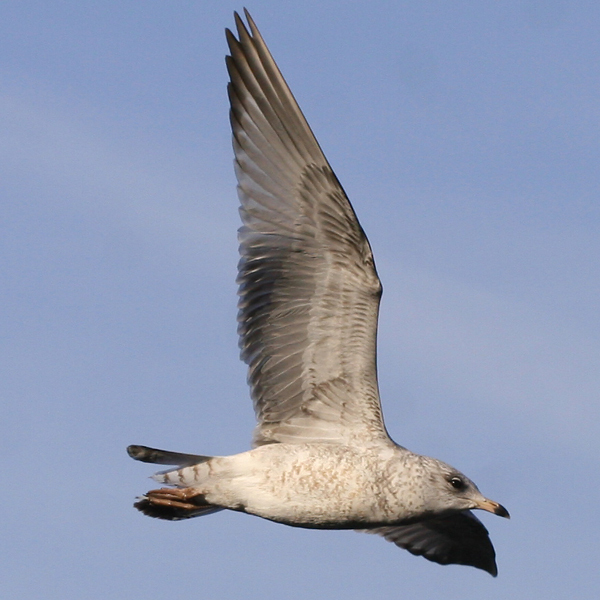 The park had all three expected species of gulls, with Ring-billed Gulls like the first-winter one below the most prevalent. From Milburn Pond Park we moved on to more familiar ground (to me anyway), Cow Meadow Park. Here the main waterfowl attraction was lots of Brant, but Mallards, Green-winged Teal, and American Black Ducks had some pretty decent numbers as well. Several Black-crowned Night-Herons were roosting in the trees around the small pond, and we managed three species of hawk before we left. We also cleaned up a bit on sparrows, with Chipping, Field, Song, White-throated and Swamp Sparrows as well as Dark-eyed Juncos all making an appearance. I was happy to spot a Brown Creeper flying to the base of a nearby tree and successfully pretended to have just noticed it working its way up the trunk (it never hurts to let other birders think you have the eyes of an eagle). Yellow-rumped Warblers (our only warbler species of the day, not surprising for November), Ruby-crowned and Golden-crowned Kinglets were plentiful, in fact both species of kinglet were present at almost every stop we made. At Cammann’s Pond, a brief stop after crossing over the Meadowbrook Parkway, the highlight was undoubtedly the at least 38 Black-Crowned Night-Herons roosting on a small island in the pond while Brant swam, grazed, and flew in flocks. Northern Shovelers were also present, as were more Hooded Mergansers. Our last stop of the morning’s outing, Mill Pond Park, had quite a few waterfowl, though participants of past years’ trips felt that there weren’t as many as usual. Nonetheless we all enjoyed circumnavigating the pond on a nice trail and spotting a bunch of American Coots, a nice drake Wood Duck, and some of pretty much every other species of duck or goose that we had already seen. All together it was a great way to spend the morning, with good birders, nice sunlight, and lots and lots of birds. And this will serve as a good a spot as any to remind New York City area birders that the Queens County Christmas Bird Count is Saturday, December 20th this year…you all better turn out in numbers (we want to blanket the borough with birders)! More details to follow as the date gets closer. I bird in Nassau county once a month or so, but I usually go to the Massapequa Preserve, mostly because its easy to reach by public transportation. Taking the Long Island Railroad from Queens to Massapequa I see a series of ponds and wooded areas on the way. I’ll have to find the closest train stops and bird those places. I’ll see if I can get to the places visited in the post by public transportation. Nice trip! Great inflight shot!